It’s like the enchanted lakes in fairy tales. A mysterious lake which looks pretty normal if someone is watching it from a distance. However, as you approach it, you realize something is wrong. Animals and birds that normally should be flying and singing haunt the scenery standing in absolute stillness after being turned into calcified statues. It looks like the result of an ancient curse or of a spell made by a bad witch in a fairy tale only in this case it is the truth. Well, not quite. 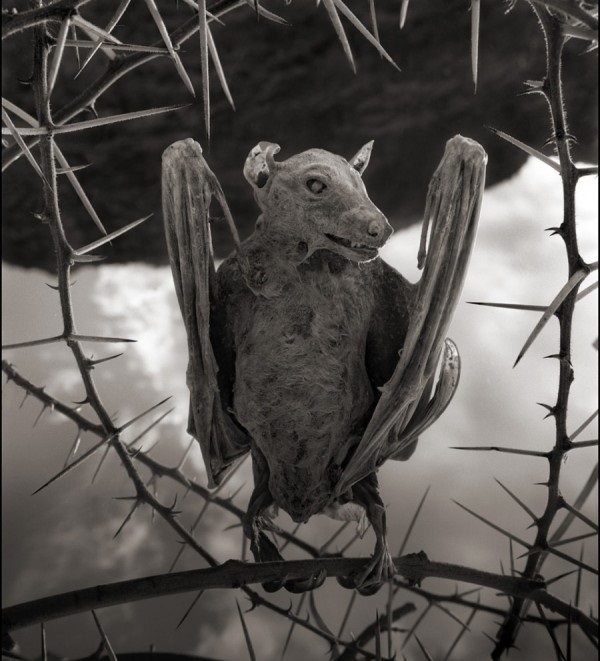 The lake was discovered by the British photographer Nick Brandt while he was travelling around the area looking for a picturesque journey of east Africa. 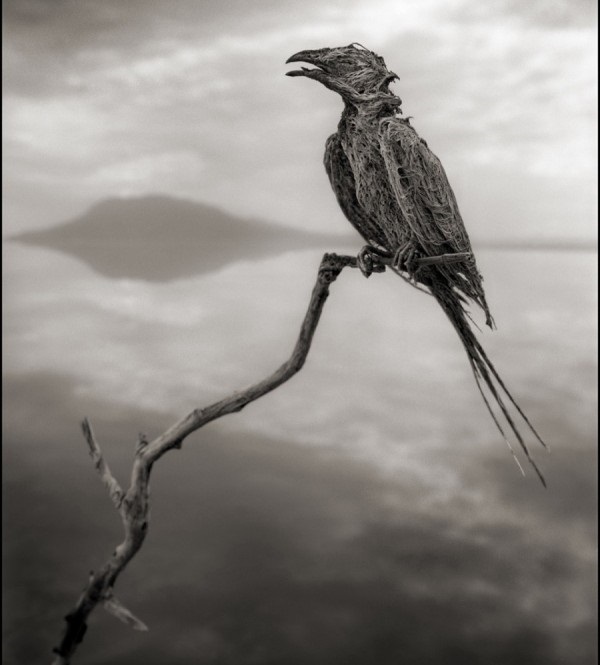 When he approached the shores of Lake Neitron in Tanzania he unexpectedly came upon a number dead birds and bats that appeared to be made out of stone resembling a lot to mummies. The sight was shocking and yet inexplicable! Carcasses of various animals – particularly birds, mummified as if they stood for a while in the lake and someone took their life from their bodies in a moment. 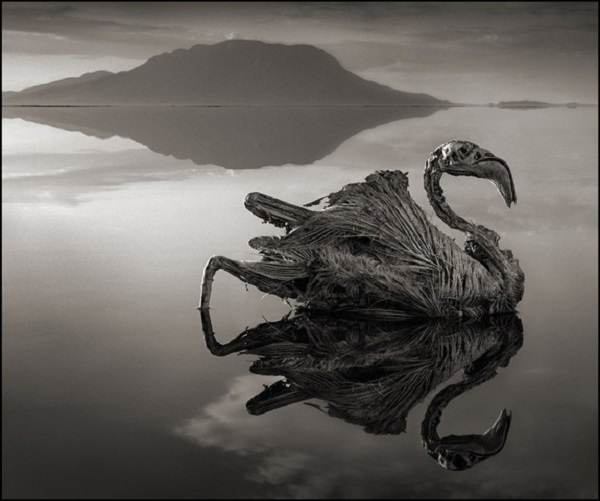 Nick Brandt discovered the standing remains of flamingos, doves and other animals washed up along the shoreline of Lake Natron. He took breathtaking photos and no one seemed to know or be able to explain for certain how they died. 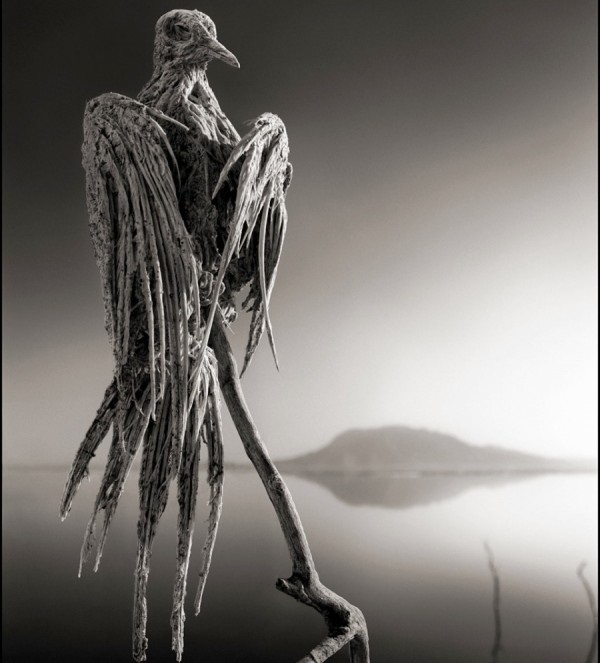 His haunting images of the Neitron lake and its dead birds were published in a book titled “Across the Ravaged Land” (Abrams Books, 2013) with many people wondering and trying to figure out the answer to the mystery of this strange, deathly lake. Many locals had seen birds crashing into the water, so some of them as well as Brandt thought that possibly the birds were confused by the reflection of the sky on the water and thus died of natural causes. However, no final answer has been given. Lake Neitron lies in East Africa and it is one of its two alkaline lakes. It is a terminal lake that does not drain out to a river or the sea and it is fed by hot springs and small rivers. Tha lake is very isolated and wasn’t discovered by the west world until 1954. It is very shallow and this fact in combination with Africa’s hot, tropical climate makes its waters really hot reaching as high as 106 degrees Fahrenheit. It is very caustic and causes severe skin and eye burning to animals coming in touch with its waters. Furthermore, it contains a lot of sodium carbonate. Sodium carbonate is a kind of natural preservatine also once used in Egypt for the purposes of the mummification process. This element of the lake is the one that after the birds’ death created this strange stone effect. However, and despite the weird deaths Brandt captured with his camera the lake supports a thriving ecosystem. So, if you wish to travel to Tanzania to resolve the mystery yourselves do not hesitate, except for the lake of death many other unexpected nature puzzles wait for you to discover them!